Some sales are simple: it doesn’t take a lot of marketing savvy or consumer engagement to sell bottles of water on a hot day at a parade. The only thing customers need to believe is that no one has tampered with the bottles. Thirsty people + $2 bottle of water = sale. No logos, no conversation, no customer tracking. But not all sales are that simple. If there are restaurants along the parade route, I’m going to need more information before I decide to stay downtown for dinner and go to any particular joint. The decision is more complex, the value proposition less obvious, the barriers to purchase a bit higher. I need to believe some things. What’s the food like? The service? Prices? Reputation? Does it look nice inside? Will my car get towed while we eat? I’m kind of tired and need to get up early tomorrow—should we just go home and throw something on the grill? I have to find a way to write that restaurant into the story of my day. Some sales are very complex. For example, should you go to a graduate school, using up years of your life and perhaps hundreds of thousands of dollars in loans? If so, which school? Think about all the things that you need to believe to fit that school into the story of your life. What about voting for a particular political candidate? Oh, sure, I’m an entirely rational voter who only makes educated decisions based on my extensive knowledge of and research into the issues—while most people are just idiots. But again, think about all the things we have to believe in order to “sell” our vote. We need to believe a complex story about the state of the world, the candidate, the alternative candidates, our own lives, our culture, our collective past, present and future. The more complex the sale, the more complex the narrative we need to believe in making the purchase decision. Most often, it’s a narrative we need to write in our own minds or even subconscious—or have it written there for us by The Brand Storytellers. You’ve been hearing narrative your whole life, since your parents read you Where the Wild Things Are. Every story has a protagonist and a conflict. The protagonist struggles to resolve the conflict along a timeline. Whenever you make a purchase, you’re creating a narrative: you (the protagonist) have an unmet desire or problem (conflict) in your past, and you’re purchasing something in the present because you believe it will make your future better. The more complex the product, the more you need to believe, and so the story becomes more complex and nuanced. 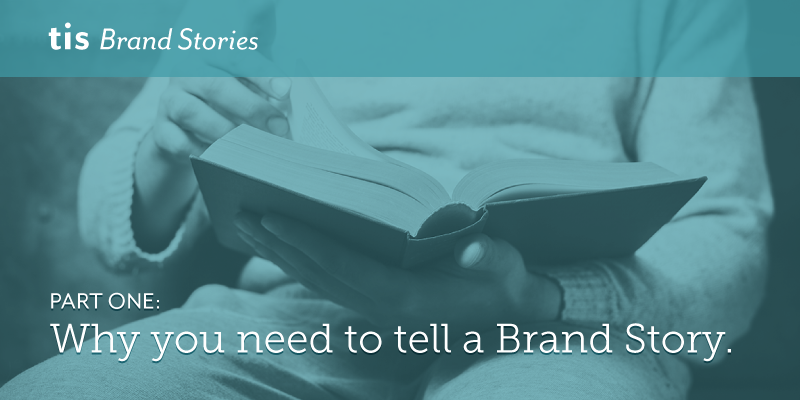 But what exactly is a brand story? Brand stories are never the history of the product or company. In fact, brand stories are never really about the product or seller at all. Brand narratives are stories customers believe about their own lives. We are the protagonists of our own stories. A successful brand narrative is always about the consumer and gives consumers reasons to write the product into what they believe about their own pasts, presents and futures. For that reason, your brand is never the story you tell about your company—it’s the story other people believe about your company and how that affects them. And because of that, marketers can never control a brand, they can only influence it. United Airlines can talk about “the friendly skies” all day long, but they can only influence their brand narrative. And you never, ever want to be in United’s position, trying to reactively influence the story being told about you. Obviously, you want to proactively influence the narrative by aligning your brand with consumers' beliefs and values, dreams and fears. A well-constructed tale, told well with the right words and images, spaces and actions can resonate with your customers at the subconscious, sub-rational level. The less obviously necessary your product, the more intangible your value proposition, the more complex your sale, the more powerful your brand narrative needs to be. For that, you need a brand ally. And that’s where The Image Shoppe enters your tale. Contact TIS to begin writing your brand narrative, and stay tuned for the second installment of this series next week.